In the wake of the relocation of Restaurant Zoe, and the takeover of that Belltown spot by chefs Brian McCracken and Dana Tough, come details about the food and mood we can expect to find when that dynamic duo — the owners of Spur gastropub and Tavern Law — unveil their latest effort this fall. Though initially mum on the subject, “We had a very clear vision of what we wanted to do,” McCracken explained during a show-and-tell last week. Their plan: to create a restaurant and bar meant to remind us of an era of early 20th-century elegance: The Coterie Room. Unlike their other decidedly innovative 21-and-over evening venues — bars, really — this one welcomes all for lunch, dinner and brunch. Here, we’ll lift a fork to sophisticated takes on American standards like eggs Benedict and fried chicken. “Everybody needs an eggs Benedict, right?” says Tough, whose silky sous-vidified egg arrived on toasted brioche, with orange-scented sauce choron, shaved asparagus and olive tapenade. (You might brunch instead on corned-duck hash.) Luncheon? Expect a brief, sandwich-stacked card whose classic stylings will include, if you’re lucky, a not-so-standard steak sandwich built with Wagyu sirloin and caramelized onions, its accompanying potato salad tossed with creme fraiche vinaigrette. The dinner menu’s set to be a lengthier affair, a mix of small plates, entrees and sharable platters. Food enough for two hearty eaters, their chicken is brined overnight, bathed for hours sous-vide, then buttermilked, battered and deep-fried. Hot gravy, poured tableside, and bacon-bedecked mashed potatoes gild that lily. Known for their artful alchemy in the kitchen, “We never forget that we don’t cook for ourselves,” Tough says. Their modernist tools-of-the-trade and signature surprises aside (see: Spur’s carpaccio with fried bearnaise), “We want the menu to be approachable, to complement Spur,” not compete with it. Hence, such “gateway” dishes as the burger that’s sure to be a draw. 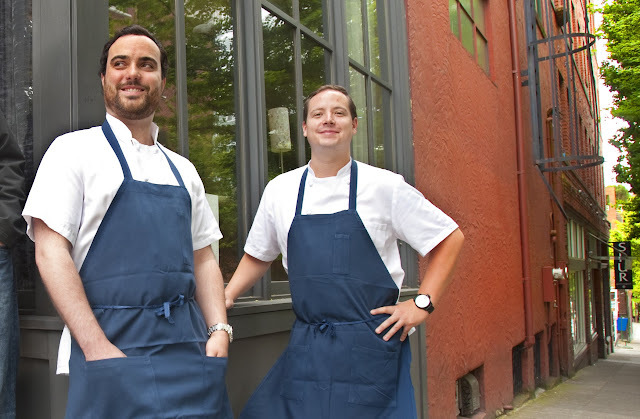 In the three years since this pair hit the ground running, first at Spur, and later with Capitol Hill’s Tavern Law, they’re ready to widen their embrace on Seattle’s culinary scene offering their studied take on food that’s at once “humble, rustic, yet elevated,” they say. Betcha can’t eat just one (bowlful) of “ham cracklin’s”: humble, rustic, yet elevated. Their hope, as they begin a monthlong interior remodel, is that you’ll come to think of The Coterie Room as a contemporary social club, one where you and your coterie might drop by for a drink and a snack (see those chic chicharrones, above), and take advantage of the valet parking they’re in the process of securing. “To gain a loyal customer is to gain their trust,” Tough says. And knowing these guys, I trust they’ll pull it off.